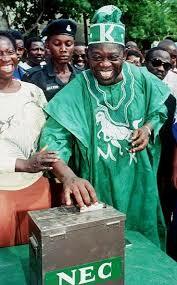 ‎Immortalise Abiola now, Atiku counsels FG, says we can’t wish away June 12 – Royal Times of Nigeria. 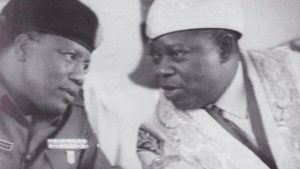 Late MKO Abiola with former military President Ibrahim Badamosi Babangida, who annuled the 1993 Presidential election. Former Vice President and chieftain of the ruling All Progressives Congress (APC), Atiku Abubakar has urged the federal government to immortalise the acclaimed winner of the June 12 Presidential Election, Chief MKO Abiola, saying the events of that day cannot just be wished away. “June 12 and the events that brought it are part of our country’s history and cannot be forgotten, especially because of the unity and comradeship displayed by Nigerians on that Election Day in 1993”, Abubakar said. In a statement issued by his Media Office, Sunday in Abuja, the Wazirin Adamawa described “late MKO Abiola, the leading personality of the June 12 struggle as a national ‘Hero and Patriot’ deserving of accolades and honour by Nigerians. He calls on the Federal Government to pay the necessary tribute to the late chief Abiola of blessed memory by naming a befitting national institution after him”. According to him, the events of June 12, 1993 are a watershed in the history of the nation and therefore it behoves all Nigerians to work hard to ensure that the nation never again repeats that painful experience. “Atiku Abubakar recalls that June 12 traumatized Nigerians and made some people to question the unity and oneness of the country and whether true democracy can take root in the country. “The Waziri commends Nigerians for moving beyond the challenges thrown up by June 12 and putting in place a democratic system of government that has lasted for 18 years. He says that it is a testimony to the innate democratic nature of Nigerians that today, democracy is flourishing in the country adding that restructuring of the country as being demanded by some well-meaning Nigerians would further consolidate democracy and give greater impetus to the unity and development of the country. “According to him, restructuring of the country would lay a solid foundation for prosperity and self-reliant development across the country by introducing healthy competition among the constituent parts of the Federation based on the principle of comparative advantage”, he added.